Want a taste? Click here to read an Excerpt. Supermarket produce sections bulging with a year-round supply of perfectly round, bright red-orange tomatoes have become all but a national birthright. But in Tomatoland, which is based on his James Beard Award–winning article, “The Price of Tomatoes,” investigative food journalist Barry Estabrook reveals the huge human and environmental cost of the $5 billion fresh tomato industry. Fields are sprayed with more than 100 different herbicides and pesticides. Tomatoes are picked hard and green and artificially gassed until their skins acquire a marketable hue. Modern plant breeding has tripled yields, but produces fruits with a fraction of the calcium, Vitamin A, and Vitamin C, and fourteen tiimes as much sodium as the tomatoes our parents enjoyed. The relentless drive for low costs has fostered a thriving modern-day slave trade in the United States. How have we come to this point? Estabrook traces the supermarket tomato from its birthplace in the deserts of Peru to the impoverished town of Immokalee, Florida, a.k.a. the tomato capital of the United States. He visits the laboratories of seedsmen trying to develop varieties that can withstand the rigors of agribusiness and still taste like a garden tomato, and then moves on to commercial growers who operate on tens of thousands of acres, and eventually to a hillside field in Pennsylvania, where he meets an obsessed farmer who produces delectable tomatoes for the nation’s top restaurants. Throughout Tomatoland, Estabrook presents a Who’s Who cast of characters in the tomato industry: The avuncular octogenarian whose conglomerate grows one out of every eight tomatoes eaten in the United States; the ex-marine who heads the group that dictates the size, color, and shape of every tomato shipped out of Florida; the United States attorney who has doggedly prosecuted human traffickers for the past decade; the Guatemalan peasant who came north to earn money for his parents’ medical bills and found himself enslaved for two years. Tomatoland reads like a suspenseful whodunit and an exposé of today’s agribusiness systems and the price we pay as a society when we take taste and thought out of our food purchases. “Yikes. Industrial beef and industrial chicken we know about. But it turns out the tomato is just as gross. Read it before your next B.L.T. In fast-moving, tautly narrated scenes, Barry Estabrook tells the startling story of labor conditions that should not exist in this country or this century, and makes sure you won’t look at a supermarket or fast-food tomato the same way again. But he also gives hope for a better future–and a better tomato. Anyone who cares about social justice should read Tomatoland. Also anyone who cares about finding a good tomato you can feel good about eating. Come excerpts from the recent New York Times review. In this eye-opening exposé, Vermont journalist Estabrook traces the sad, tasteless life of the mass-produced tomato, from its chemical-saturated beginnings in south Florida to far-flung supermarkets. Expanding on his 2010 James Beard Award–winning article in Gourmet magazine, Estabrook first looks at the tomato’s ancestors in Peru, grown naturally in coastal deserts and Andean foothills, with fruit the size of large peas. Crossbreeding produced bigger, juicier varieties, and by the late 19th century, Florida had muscled in on the U.S. market, later benefiting from the embargo on Cuban tomatoes; the Sunshine State now produces one-third of the fresh tomatoes in this country. To combat sandy soil devoid of nutrients, and weather that breeds at least 27 insect species and 29 diseases that prey on the plants, Florida growers bombard tomato plants with a dizzying cocktail of herbicides and pesticides, then gas the “mature greens” (fruit plucked so early from the vines that they bounce without a scratch) with ethylene. Behind the scenes, moreover, there exists a horrendous culture of exploitation of Hispanic laborers in places like Immokalee, where pesticide exposure has led to birth defects and long-term medical ailments. Estabrook concludes this thought-provoking book with some ideas from innovators trying to build a better tomato. Link to PW.com. Estabrook gives the history, science and politics of the tomato, all in service of laying the blame for the ruination of a wonderful fruit. 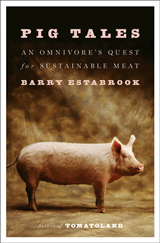 He looks through the lens of the fast-spreading movement to draw attention to the sources and quality of our food. Barry Estabrook is a masterful story teller with an uncanny ability to render intricate intellectual pathways entirely accessible. Tomatoland deftly leads us through a complex maze of interrelated occurrences, legal decisions and cultural practices (human and tomato) in a narrative that reads a little like a thriller. I finished the book in two sittings and found myself identifying with farmers, migrant workers, lawyers and even some large growers. Our enormous appetite for having pretty much any food available to us at anytime of year has led to a system where yes, you can have a tomato in February, but the cost is a lot more than the $1.25/lb you’re likely to pay at your local Walmart. It comes at the cost of enormous environmental damage and shocking worker abuse. It utilizes thousands of migrant workers, some of whom are undocumented, and many of whom live and work in literal slave conditions. And since the muggy lowlands of Florida are not native habitat, a tomato plant there can fall victim to as many as 27 separate insect species and twenty nine different diseases, necessitating a plethora of chemicals that are as hard on the workers and the land as they are on the pests. Then there’s the 31 different fungicides in use. The list goes on. Read the entire review. So I’m exhorting you to buy Tomatoland (and wrote a blurb for the back, something I almost never do, to tell everybody else), and not just because it’s a gripping and shocking picture of modern-day slavery that shouldn’t exist in this country, let alone any other. Barry claimed this territory for himself in a hard-hitting narrative on the Coalition of Immokalee Workers in Gourmet, which won a James Beard award and was one of the pieces Ruth Reichl was rightly proudest of during her tenure as editor. In fact, I see from the Tomatoland page Barry has built on his site that she says in a blurb that it’s the piece she’s proudest of having published. 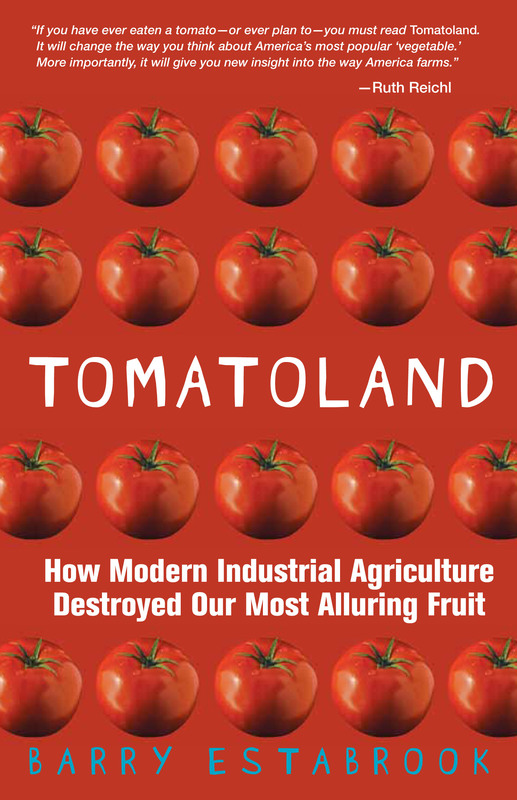 Read award-winning journalist Barry Estabrook’s Tomatoland: How Modern Industrial Agriculture Destroyed Our Most Alluring Fruit (Universe), and you won’t look at a tomato in the same way again. 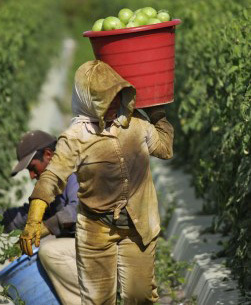 What began as an exposé on the slave-like working conditions faced by modern-day tomato workers (“The Price of Tomatoes,” Gourmet, March 2009) is now a book that paints a shocking behind-the-scenes picture of one of the most beloved fruits. The issues that Estabrook writes about in the book cannot be ignored by anyone who thinks of him/herself as a conscientious and informed consumer. In Tomatoland, Estabrook presents a cogent case for reform, challenging everyone to stand up for what is good not only for the taste buds and the wallet, but also for the soul. In his eye-opening new book, award-winning food journalist Barry Estabrook reveals the shocking truth about the modern tomato industry. In a gripping story of modern-day slavery, dangerous pesticides, and old-fashioned greed, Estabrook shows that the bland taste of most supermarket tomatoes is the least of their problems. 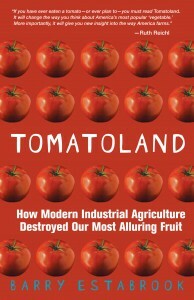 Tomatoland: How Modern Industrial Agriculture Destroyed Our Most Alluring Fruit is in bookstores now. Scott, The Kindle and other electronic versions will be available on or shortly after the “official” publication date–June 7. Thanks. Barry, I am so happy to have discovered you. Just as I stumbled across your site I thought “I don’t want to make things that hurt people”. I’m a designer and I my aim is to work with fair trade ethical manufacturers so that people don’t end up dying of cancer from the toxins of objects I have designed. I am just about to read your article about African American farm labourers. I will be following you on Twitter, and good luck with the book! Test Tube Burgers- the book Tomatoland..The Future of Culinary Arts? Today I was recently given the following article to read by non-culinarian colleague of mine, he asked me if this was going to be the future of Culinary Arts. Let us pray that it is not. Please read this article: Coming soon, the test-tube burger: Lab-grown meat ‘needed to feed the world’ this article describes how scientist are taking stems cells from animals and turning them into minced tissue to form a hamburger. Their hope is to be able to feed the world. My first response was to see if this article was legitimate or a joke. The source of the article is from actual research going on at Oxford University in England and University of Life Sciences in Norway. Reading this article coincides with me finishing the book TOMATOLAND-How Modern Day Industrial Agriculture Destroyed Our Most Alluring Fruit by Barry Estabrook. In both the Test Tube Burger article and the TOMATOLAND book, man has chosen to genetically alter and or modify natural food products to create a non natural product to be mass produced to consumers, not matter the nutrient content or the taste. In the case of tomatoes, scientist and farmers in Florida have created a product that is regulated by the Florida government and laws as to the specific size, color (green), shape, skin texture etc of the tomatoes they produce and then sale. The tomatoes are not grown for flavor or taste, they are picked green and then gassed with ethylene to slowly turn them red. Additionally the tomatoes we buy in the supermarket 365 days a year are soaked in chemical fertilizers and pesticides. These tomatoes are in many instances picked by modern day slaves, victims of human trafficking. Consumers in parts of the world where food is readily available and reasonably priced should focus on foods that taste good, not only food that look good. Foods that are full of their god given natural vitamins and minerals, not foods that have over time have lost as much as half of their original nutrients and foods that are not drowning in chemical fertilizers and pesticides. In parts of the world where food is not in abundance and in areas of the world where people are starving, it is my opinion we should be finding natural ways to give these people nutritious food, in ways that are environmentally sound, engaged in fair trade practices and that are sustainable for the indigenous peoples. Not by creating food in a laboratory from stem cells, or by genetically modifying foods. Barry – I can not wait to read Tomatoland. Thank you for exposing the background of this heinous food crime. After growing up on the succulence of garden-grown beefsteaks during summers back East, I was mortified when I tasted my first grocery store tomato in California 25 years ago. The quality’s gotten worse since then – if possible – but thankfully we have access to some good local tomatoes during season. Btw…caught the tail end of your interview with Terry Gross. Thanks for the great tips on shrimp…though I’m feeling a little bit nauseous now after last night’s shrimp dinner. Really enjoyed your talk on NPR’s Fresh Air though the twins (10) were moaning at first about not playing any music, they also got into the talk and are now very concerned about what they can do to help tomato field workers in Florida. I work at Trader Joe’s and it is always interesting to watch the progression from our vendors from one country to next as tomatoes go out of season. I have to say, the only tomatoes we buy that consistently taste good are the Trader Joe’s brown tomatoes, Kumato, from Canada. When we lived in Central Asia and Russia, the tomatoes were always so good you barely needed a pinch of salt to eat them with! I grew up in Kentucky in the 1950s and had begun to think that that distinctive, tangy “bite” of the perfect tomato was a figment of my imagination. I search for that tomate taste every summer but I rarely succeed, even though I tend to buy my produce at the local markets. I’ve even tried growing my own, with minimal success. How I’d love to see the world return to a love of taste over convenience. Thank you for writing the book. I’m buying myself a copy, just as soon as I know my SS checks will continue. My special interest is water management in Florida and I note that you could have done a bit more work in that regard. However, your look shows how this kind of farming is connected to many other things and your book couldn’t cover all of them in depth. Excellent book! Thanks for writing it! My brother told me about your book couple weeks ago – he has just finished reading it and recommended it to me. I am hoping to check out a copy from the library this week and take it with me on my road trip to Alaska. The best tomatoes I have tasted were the heirloom varieties grown organically by my mother-in-law in Southern CA… Weighed in at nearly 2 pounds each, they are absolutely heavenly. This year I would love to see the winter tomato display in the supermarket all cleared out…with stacks of this book in its place! This book was truly amazing! I couldn’t put it down. I greatly appreciate the insight and now thoughtfully ponder each veggie and fruit that I eat. I now realize that as a vegetarian I still have to be mindful of the way that my food reaches my plate! Hi, Barry. I am almost done reading Tomatoland but had to write about it before getting to the end even, because my thoughts couldn’t wait any longer. I’m on a mission to change how we think about, buy and eat food and I concerned myself fairly knowledgeable, but your book made me realize just how ignorant I am of industrial agriculture. I am questioning everything in my kitchen right now, wondering the “true story” behind it. I wrote about your book at http://local.farmersmarket.com/blog/localvore-local-lore/tortured-by-tomatoes-the-ugly-reality-of-cheap-food because I wanted to explore a little bit of the mindset that got us to this place where cheap and convenient are the most important attributes a food can have. Thank you for writing the book!! Can’t wait to start this today. I heard the author interviewed on npr a few months ago and have been wanting to read this ever since. Last night went to buy it for my Kindle and was thrilled (for me, less so for the author) to see it was only $2.39! I hope the low price means many, many more people will read this book! Important stuff for people to understand. The revolution begins on your dinner plate! I blogged about your book. Thank you for writing it. In Clover, that was a beautiful article/review. Thank you so much. I have been growing heirloom/ open-pollinated tomatoes for over 30 years. I am reading and appreciating Tomatoland now. However I just finished the chapter where you dissed Stupice tomato. This is a variety that I grow one or two of every year because they are so early. In my experience they are pretty good tasting,far superior to store-bought although not as good as later season tomatoes. This is almost always the case with early tomatoes. I have found that climate and weather have a big effect on tomato flavor. Early tomatoes often originate in colder climates. Maybe that is why the Florida-grown Stupice you ate was so terrible and my Wisconsin-grown Stupice are pretty good. Also I use organic methods and I’m sure this must make a difference. On the other hand I have stopped growing Brandywine, I just don’t think they’re very good. Sacrilege, I know. I think this also must be chalked up to climate. One of my favorites is Old German . Thanks for the comment. I didn’t mean to diss the Stupice. I just wanted to make the point that the University of Florida tasting panels did not find all heirloom tomatoes great tasting. Harry Klee, the professor in charge of the study, made it clear to me that there were huge regional differences in the way heirlooms taste, which makes sense, given that they were developed in specific areas by home growers. Brandywine is a perfect example. They are great in the Northeast, where I live, but farmers in Florida and Alabama that I’ve spoken to say that they are disappointing in those areas. I guess we should add your state to that list. I always get asked what the best tasting tomato is. My advice is to go to a farmers market in your area in season and buy a wide selection of local tomatoes, or get some from gardeners you know, and then plant the ones you like the best. I have only begun to read Tomatoland (about 2 chapters in as of now) and I have already decided to write my first blog (ever) once I become a staff writer for the Law & Global Justice Forum, a student run organization at my law school, University of San Francisco School of Law. I stumbled upon your book as it was recommended by Amazon, who personalizes my searches for me, and I am so grateful to have to decided to check it out electronically from our public library. As a young adult trying very hard to educate herself in the world of nutrition in America with continuous discoveries in our oh-so-productive nation, I would have never known about the fresh tomato industry and how it has managed to successfully permit slavery for so long without notice (by the right people that is). I look forward to finishing the book soon and wanted to thank you for your generous efforts in painting such a just picture of what we are living with. I hope to pay it forward and continue the movement to raise awareness of this socially unjust industry and expose other fields of agribusiness that are negating the human costs for the sake of some cents. Wonderful book, wonderful read until the end! Darn wonderful writing and darn great public service journalism. Thank you Mr. Estabrook for enlightening us! I would never have read “Tomatoland” if I had not been listening to NPR and heard your interview. The idea that a book can be written about a chance tomato falling off a truck amused me. Growing up on a Sicilian diet, you can bet I know a thing or two about tomato taste. My parents’ garden produced lovely tomatoes, actually red, and bursting when cracked open. Over the years, I’ve stopped buying and eating them. I thought, “They are out of season; the texture is different and so dry than what I remember; maybe my taste buds have changed, etc.” I just thought it was me. But, no. Thank you for explaining how complicated the reason is for why I can’t buy a good tasting tomato. I know nothing of the farm or food industry, but your book had me rivetted and angry. I’ll read more about both. And, take advantage of my farmers’ markets, every day of the week. New Study Compares Prices at Farmers’ Markets and Supermarkets. The Results Might Surprise You.